Here are some excerpts from an article by Dr. Richard Curwin of David Yellin College describes how “fair” in a classroom doesn’t mean equal. He gives seven valuable tips for teachers. Click here for the original article. There are two skills that separate great teachers from good ones. I explained that the first skill is the ability to reframe student behavior, to see it in new ways. Today I want to discuss the second skill: knowing how to treat students fairly by not treating them the same. If you ask students what are the most important qualities they like in teachers, one of the universally top-mentioned is fairness. Teachers and schools strive to be fair and build programs and polices based on this value. But what is fair? Many define it as treating everyone the same, but I would argue that doing so is the most unfair way to treat students. Students are not the same. They have different motivations for their choices, different needs, different causes for misbehavior and different goals. 1. Everyone has the same rules. 3. Equal isn’t always fair. 4. 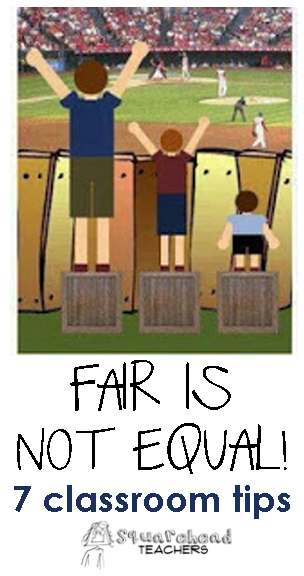 Teach the concept of fair vs. equal to your class before implementing it. 5. Follow the basic tenets of great discipline. 6. Be willing to discuss your strategy with students. 7. Be willing to discuss your strategy with parents. Being truly fair is harder and requires more work in the short run that just treating everyone the same. In the long run, it saves time and is more effective. And when it comes to treating everyone the same, every child deserves a lot better than that. This entry was posted in Management and tagged Children, Education, Elementary School, fair, Kids, Teachers, Teaching by Squarehead Teachers. Bookmark the permalink.